The Tibetan plateau, 4000 metres above sea level on an average, is acclaimed as the roof of the world with the highest mountain ranges on the earth. On the north, this “sacred snow area” as it being called, is bounded by the Kuenlun Mountains. To the south and west o the world famous Himalayas stand with its principle peak of Mount Jo-mo Glangma (Mt.Everst) callled affectionately “Mount Goddess” by the local people. Between the two mountain ranges the Gang Te-se Mountains (Mt. Kailas) lie across the southwestern Tibet, which contains cliffs and crisscross glaciers of great momentum. 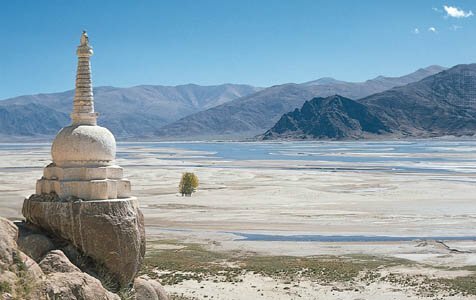 Mapham Tso (Lake Manasarawara) the biggest lake in the world, lies near the southeast side of the principle peak of Gang Te-se, Mount Rinpoche situated in Pu-‘rangs county in mNga-‘ris district. Surrounded by the world’s highest mountains, the Tibetan plateau commands a characteristic scenery. The boundless prairie of North-Tibet is one of the three pastoral areas in China. The southwest part of Tibet, there is the extensive dense woodland regarded as important natural forest zone bordering on YunNan’s and Shichuang’s woodland. In summer the Prairie of North Tibet is just like a carpet of green grass bustling with youthful vigour. The cone-shaped tents, the thriving flocks and herds of fat, strong sheep and cattle, and the unrestrained handsome herdsmen are well constituting a picturesque grazing scene. Joined by rolling hills and clear lades, the North Tibet has the well-known lakes: Nam Tso, PangkongTso, Seling Tso, etc, their grass banks are the ideal habitats for swans and yellow ducks, so you can find wild eggs everywhere. What’s more, there are accumulations by many saltwater laces of chemical industrial raw materials including caustic soda, mirabilite and the glittering borax. Needless to say, the North Prairie is extremely cold. land and rivers are completely frozen over for seven or eight months in a year. Yet discoveries were made, however, that there are 300 spots of terrestrial heat and hot springs, many of which advantages have been taken from. The Yangs-pa-can terrestrial heat power station has been put into operation. Two assembling units of 2000 kw. have started generating electricity from damp stream. On opening the sluice gate, vapour and hot water spurt into the air from the well at a height over a hundred metres with tremendous noises resounding through the skies. As for the hot-water lakes, they boast a marvellous spectacle just like the fairyland being shrouded in misty steam curling slowly upward. People can plunge into the water bathing or swimming, for the lakes remain with the water temperature at 30-40¡æ even when the temperature of the air is about 0¡æ. Like a gaint dragon in a total length of 1970km, the Yarlung Tsangpo River runs from east to south Tibetan deep valleys, turns sharp through Metog county and takes another turn toward the west, then flows into the Indian Ocean. At its lower reaches the counties of Metog, rDzayu and so on, recall sightseers the regions south of Yangtze. Rice, peanuts, oranges, bananas, pears and watermelons are produced in this area. Most part of this area is under the height of 2000 metres above sea level and the lowest part over 800 metres. It is one of the most grandioes sites that coexists with peculiar topography, varied temperatures, plants and natural landscape, which extends continuously to the eastern Tibetan woodland area and so forms the natural mat shalter. This woodland area is a boon to wildlife including tigers, leopards bears, daer oranggutans and lynx. All kinds of wild plants are waiting for men to explore and study. Valuable ingredients of traditional Chinese medicine such as cordycepssinensis, fritillaria thunbergii, Chinese angelica, captia chinensis, comoslinum, rhubarb and ligusticum wallichii have already been collected and made full use of. Preliminary geological prospectings have testified that the biggest potential copper mine in Asia lies lies buried in Tibet, along with present in varying quantities are iron, magnesium, chromium, zinc, borax, mica, mirabilite and sulfur.